The capital's economy has grown by 12.4% since the depth of the recession. That's more than double the growth recorded by its closest rival. When it comes to assessing the strength of the UK’s economy, it is often argued that London is a ‘bubble’ which distorts figures for the rest of the country. Now official figures appear to back that up. Since the start of the credit crunch, the capital’s economy has grown almost twice as fast as its closest regional region, figures from the Office for National Statistics show. Between September 2007 and September 2012, London’s economy grew by 12.4%, and more than a quarter of a million jobs were created. That compares to 6.8% growth recorded by its closest rival, the south-west. It is also more than five times more than the 2.3% growth seen by the east Midlands. 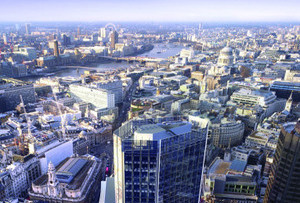 The number of active businesses has also grown ten times more quickly in London than the rest of the country. The net increase in businesses between 2007 and 2011 was 11.5 % in London – that far outstrips the rest of the UK, where the number of active businesses either decreased or increased by less than 3%. Meanwhile the gap between London wages compared to the UK average has also widened. Average household income per head in London is 30% above the UK average, up from 26% above the UK average in 2006.